Some dishes have really strange names. For example, the Micro-wavy Bun that doesn't use the microwave, or the Milk Toast that doesn't use milk. 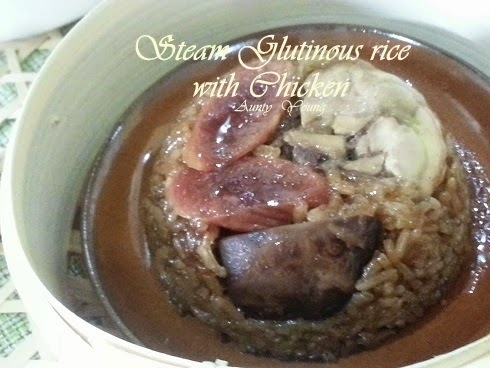 Literally translated, this recipe's Mandarin name reads "Glutinous Rice Chicken", yet this dish is more about the glutinous rice than the chicken. This strange way of naming dishes is probably a tactic in piquing curiosity. And with curiosity comes the inspiration to master the dish. I've often ate this dish at dim sum restaurants, so I decided to give this dish a go to see the difference between home-made and commercial. 1. Heat up 1 tbsp oil, saute chopped shallot until fragrant. Add the glutinous rice and other ingredients/ seasonings in B. 2. Place this in a lightly greased steaming bowl. 3. Steam over medium high heat for 15 minutes. 4. Fluff the rice with a fork. 5. Place steamed rice aside for later use. 1. Heat up a 1 tbsp oil, saute chopped shallot until fragrant. 2. Pour the ingredients A and stir fry until the meat is cooked. 3. Place aside for later use. 1. In lightly greased bowls, place the lap cheong, chicken and mushrooms. 2. 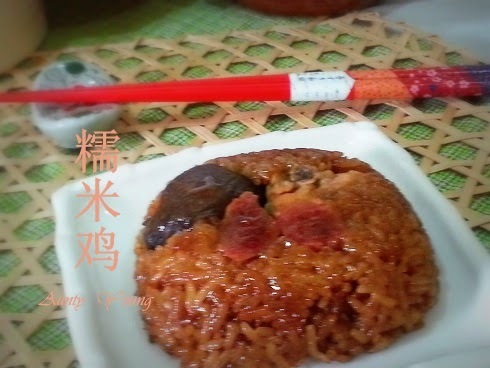 Cover with glutinous rice and press hard. 3. Sprinkle 2 tbsps of water and steam over medium-high heat for 30mins or cooked. 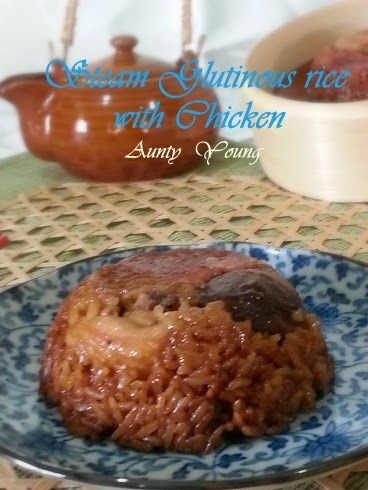 This home-made Steamed Glutinous Rice with Chicken is just as good as those found at dim sum restaurants. 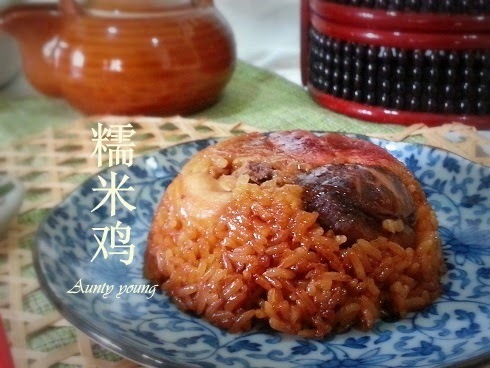 The rice soft and fragrant, the chicken delicious, the mushrooms and sausages sweet and lovely. To put it in a nutshell: yummylicious! Hi Aunty Young, home-cooked is definitely better. I think it is not that oily and we can add more 'liao' in it. I've tried this recipe, the LMK is good.